Boym Partners created a number of unusual souvenir building from a unique perspective. One replica series, “Missing Monuments,” is a tribute to structures which don’t exist. They have either been torn down or were never constructed after being designed. Included are the Singer Tower in NY built in 1908, torn down in 1968, and Leonardo da Vinci’s geometric church which was never built. The Palace of the Soviets, a skyscraper topped with an enormous statue of Lenin, was never completed. Construction on the Moscow skyscraper began in 1937 and was terminated in 1941 when Germany invaded. 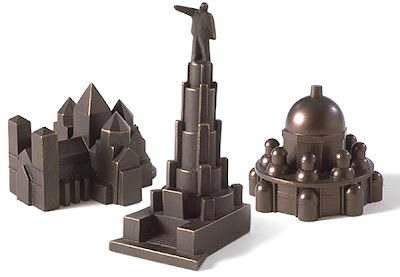 Produced in 1996, the Missing Monuments miniatures were cast of bonded bronze, hand-finished and numbered. Everything in this series has sold out. The other series, “Buildings of Disaster,” are macabre souvenirs, yet the architecture has become iconic due to the tragedies which occurred there. Constantin Boym described them as an "alternative history of architecture." The horrific events are frozen in time, captured forever in cast metal. 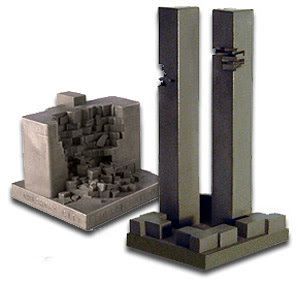 The World Trade Center with missing corners, the Oklahoma City Federal Building with a crumbled front and the Chernobyl nuclear reactor meltdown are included in this set. The Watergate complex replica seems tame in comparison to the other disaster buildings. A few building replicas in this series are still available. Below is a CNN interview about the Buildings of Disaster miniature replica series.